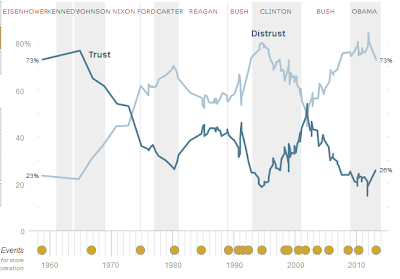 The Washington Post today reported on a Pew Research project which has tracked trust in government over the last fifty years. The results are surprising. In the sixties, during the days of the counter-culture, trust in government was at a historic high of 73%. It began to fall with the aftermath of Vietnam and Watergate, rose slightly again under Reagan and Clinton, and now has bottomed out at 26% under Pres. Obama. A libertarian interpretation of this graph: the steady expansion of government power and services is not a good representation of "the will of the people." If the public was genuinely happy with all the regulations and general largess being given out by the Federal Government, one would expect to see their trust increasing because they're getting more of what they want! Instead, the opposite has happened, and an increase in the government's power has made it steadily less trustworthy. A psychology interpretation: blame the media. Maybe government has been basically the same over this time period, but journalists have gotten more and more tools to muck-rake on our leaders. So representativeness bias leads people to think government is less trustworthy than it really is, because that's what they see on the tube. A political science interpretation: this is old news. People commonly say they distrust government in general, but when asked about their Congressperson specifically, they tend to have favorable impressions. This is why incumbents can keep winning even when Congress as a whole has a ~10% approval rating. It's always "the other guys" we don't trust, but of course our state would only send an angel into office. A demonstrated preference interpretation: who cares what people say to a pollster about their opinions of government? Their voting decisions (and continued willingness to live in this country) show that they are generally pleased with what government is doing. If the median voter truly distrusted government this much, they wouldn't keep voting for it. The Washington Post takes a lamenting tone, talking about the "death of trust in government." Frankly, I'm more optimistic. If distrust makes voters more watchful of our representatives, maybe they'll start doing more things that we want and less of the things we don't. What about an economic explanation? 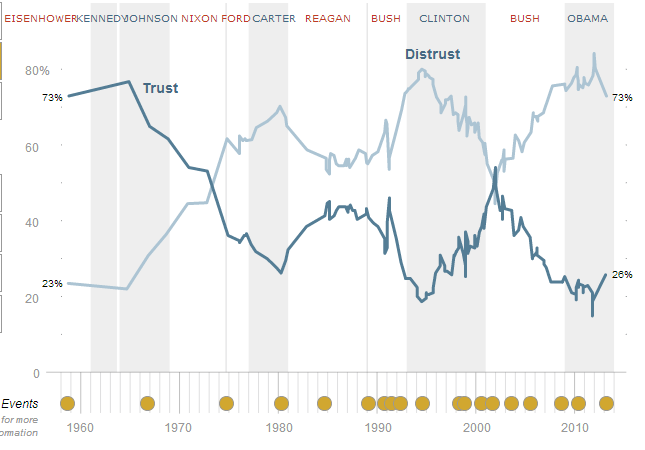 The less economic progress was shared among the public, the less people trust the government (no matter who's fault it is). Or the obvious answer... Government was actually better in the sixties. The economic explanation is plausible but I'm not completely sold - average living standards have risen in the last 50 years. I guess many people find inequality undesirable in itself so they care more about relative than absolute position, but I would expect government in the 60s to be even more elite-driven than today. Maybe the elites of yesteryear were more trustworthy than the mega-money funded politicians of today? I'm not sure I'd like to take a stance on that one way or the other.